Pioneers in the industry, Intek Instruments is a well-known Distributor, Delaer, Trader, Supplier, Wholeseller, Importer and Exporter of Linear Potentiometer / Linear Scale / LVDT Transducer / Linear Transducer / Displacement Transducer. We are an Authorised Distributor for GEFRAN Italy in North India. GEFRAN Italy, NOVOTECHNIK, OPKON, MINOR, MYAN, BALLUFF, WAYCON. Delhi, Noida, Gurgaon, Manesar, Rudrapur, Roorkee, Haridwar, Sonipat, Panipat, Agra, Meerut, Ludhiana, Jaladhar, Lucknow, Kanpur, Hyderabad, Dispur, Patna, Muzaffarpur, Chattisgarh, Gujarat, Maharashtra, Jaipur, Bihar, Ghaziabad, Faridabad, New Delhi, Chandigarh, Rohtak, Hisar, Bawal, Rewari, Karnal, Rajasthan, Shimla, Baddi, Jammu and Kashmir, Ranchi, Jharkhand, Himachal Pradesh, Dhanbad, Jamshedpur, Bangalore, Karnataka, Kerala, Madhya Pradesh, Bhopal, Indore, Jabalpur, Odisha, Amritsar, Patiala, Bathinda, Mohali, Tamil Nadu, Chennai, Coimbatore, Telangana, Rampur, Shamli, Dehradun, Haldwani, Kolkata, India, and Nepal. Resistance Range Vary as per Model No. / Part No. presses, and on many other processing machines. - The 1/2" cylindrical housing, plus the option of all fastening systems (brackets, joints or flange), makes thePZ12 series highly versatile for a wide range of applications. - The optimized mechanical structure makes the product suitable for developing various special executions (contact Gefran customer service for details). - Installation is simplified by the lack of electrical signal variation at output outside theoretical electrical stroke. 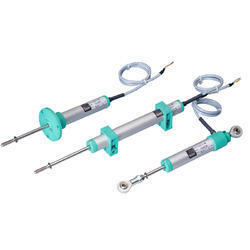 Intek Instruments is a leading Distributor, Dealer, Trader and Supplier of Linear Potentiometer. We are distributor for Gefran Italy (in North India) and Novotechnik (all over India). Some of our areas we deals in :- Delhi, Uttarakhand, Uttar Pradesh, Himachal Pradesh, Haryana, Punjab, Jammu and Kashmir, West Bengal, Maharashtra, Gujarat, Rajasthan, Andhra Pradesh, Tamil Nadu, Madhya Pradesh, and other areas of India.